Guess what, these are those cookies! And they so tassssttttyyyyy. Another perk of these gems? 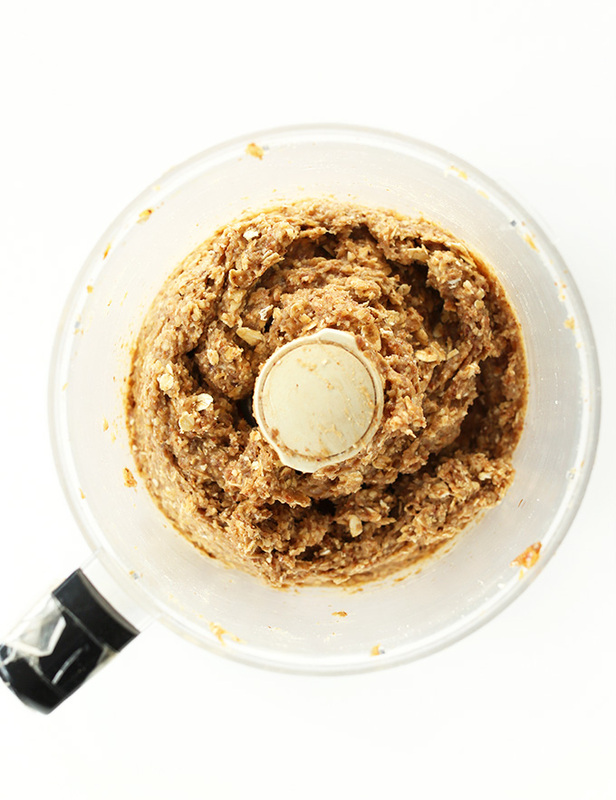 The batter comes together in a food processor! Or not. Or just eat them all yourself. I won’t tell. 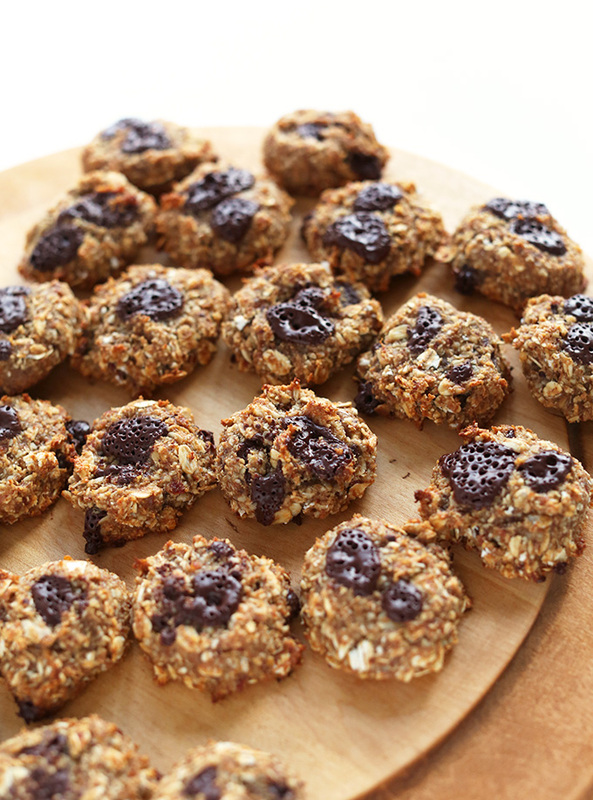 These cookies are so healthy they could actually be breakfast or a post-workout snack. I enjoyed mine during afternoon slumps and after dinner when I was craving something sweet (aka always). But, enjoy them as you wish. It’s your cookie, friend. Go wild. 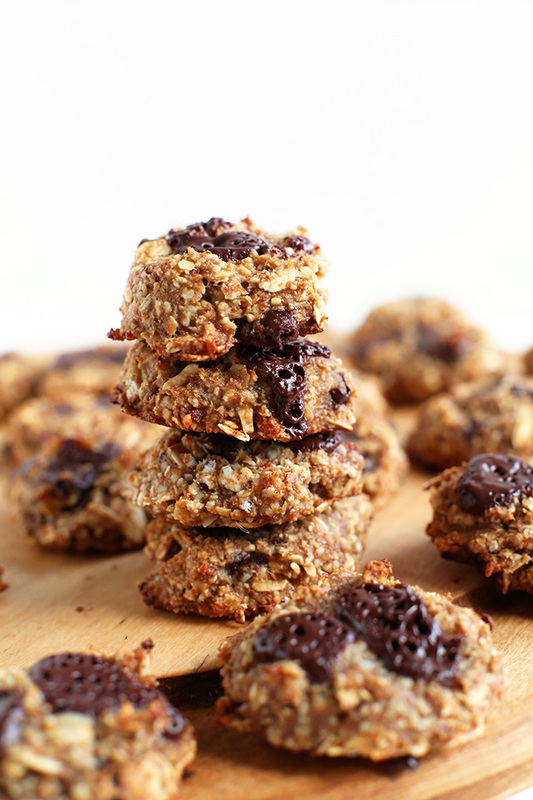 Simple, 5-ingredient V + GF cookies that are healthy, easy, and delicious. Add dates to a food processor and pulse until small bits remain. 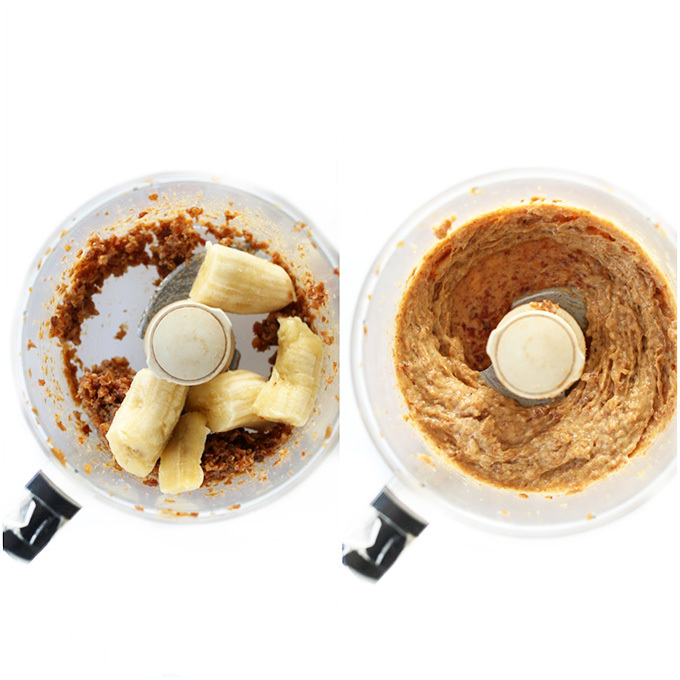 Add banana and almond butter and mix again until combined, scraping down the sides as needed. Next add the almond meal and rolled oats and pulse until a loose dough is formed. It will be kind of wet and sticky. That’s OK! You’re on the right track. Scrape your dough into a mixing bowl. 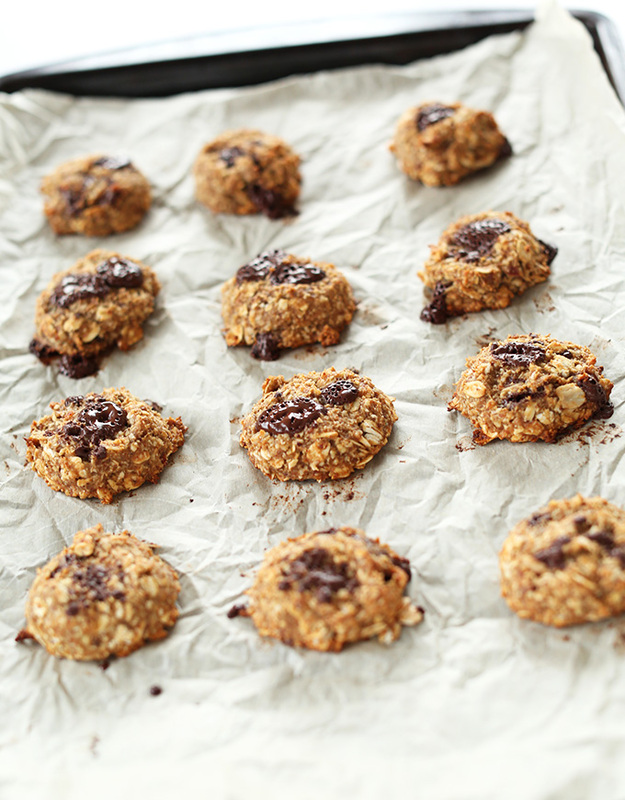 If it feels too wet to the touch to form into cookies, add another few Tbsp of almond meal and/or oats and stir. I added another few tablespoons of each until I was able to form them into cookies without them sticking to my hands. At this point, you can add in 1/4 cup of your mix-in of choice, such as dairy-free dark chocolate chips, raisins or nuts. Then chill dough for 10 minutes and preheat oven to 350 degrees F (176 C). Scoop out 1 Tbsp amounts of your cookie dough and form into loose discs, then arrange on a parchment lined baking sheet. They won’t expand so pack them closer together (but not touching). Bake for 15-18 minutes or until golden brown and somewhat firm to the touch. The good thing about these cookies is a little under-baked is OK since there’s no eggs and they’ll ultimately just be a little more moist. *Nutrition information is a rough estimate calculated with chocolate chips. Super tasty cookies! Easy to make. I used coconut flour and shreded coconut, because i didnt have any other gluten free flour! It went super well. Also pinch of cinamon and spoon of tahihi, as coconut is dry. Enjoy! can i double recipe and bake half and freeze the rest? Just made these. So easy to make and so nice straight out of the oven. Definitely keeping this recipe on file to make again. Delicious thank you. What could you substitute for the almond butter or peanut butter? I would prefer them to not have a peanut butter taste. If it’s used for binding, then maybe an egg? It might be worth a try to use an egg- though we haven’t tried it. Otherwise, we would recommend using another mild nut or seed butter that you like such as cashew butter. Hope that helps! Do you have substitute for banana? Allergy issues. Other readers have suggested a steamed or baked sweet potato would do the trick! Let us know if you give it a try. These were great. I just need to use an ice scoop next time to get them all uniformed. These are so good! They are not too sweet and are perfect for a treat. We put a scoop on parchment, made a thumbprint and added a couple of vegan chocolate chunks to mine and a small scoop of blackberry jelly for my husband’s. So good! Thank you for the recipe. Some Cookies & energy bars call for oatmeal. People going gluten free can be innodated with grains possibly causing some health issues. How can this be recipe & others made with oatmeal be made Grain free? What would a good substitute for oatmeal? I’ve made these cookies before (following the recipe exactly and sometimes omitting the almond butter because I ran out) and they were great. I’m currently living without a good processor and am wondering what an alternative method to using the food processor (other than chopping with a knife) would be? Thanks! A stick blender did the job nicely on the dates. Mixed the other ingredients with a spatula. Thanks for sharing your changes, Claire! We’re glad you enjoyed it! I just love these cookies! We like this other vegan cookie we get at a bakery and this is the closest we have been able to get to that cookie. I think we actually like these ones more! Anyway, we are doing a huge cookie bake tomorrow. How much almond meal do you think I’d get out of the large bag of almonds? We’re glad you enjoyed these cookies, Ashley! Its hard to say how much you’d get out of a large bag as we don’t know the exact size. For reference, you get 1 ¼ cups (approximately) of almond flour using 1 cup blanched almonds. Hi. My daughter and I have tried a few of your recipes recently (muffins (awesome), banana bread (awesome)), and please forgive me for not writing sooner and letting you know. Yes! For every 1/2 cup of salted butter required, you can add ¼ teaspoon of salt. I really like these. I have a family of 8 so I wanted to increase the size of the recipe so, I added one extra banana, 3 tb each of of pb fit, shredded coconut, pumpkin seeds, old fashioned oats, and 2 tbs of powdered flaxseed. 375 for 12 minutes. Sorry, but this is a complaint born of utter frustration. I am a celiac who is allergic to eggs. So I am looking for a cookie recipe made with almond meal without egg. I love dairy butter, so I do not want to skip the butter. Nor do I want to skip the sugar. I just want to skip the EGG and the WHEAT. But this is nearly impossible to find. You either have almond cookies made with wheat flour and with a flax egg, which is no good for me, or you have a complete other cookie, made with coconut flour and/or coconut sugar and/or coconut oil (all of which I hate) and a flax egg. Why is it so hard to find recipes for GF cookies without eggs without going all the way to the other kind of cookie, a complete vegan type cookie with some fake butter? I have lots of food allergies, and I have no desire to give up any of the things that I love that I can still eat, such as dairy butter. I want a recipe for almond cookies made from almond meal, butter, sugar, an egg replacer, and vanilla. I guess I’ll have to figure it out on my own, because with all the thousands of recipes on line, they are all either to one extreme or the other. Expense is also an issue for me, and I cannot go out and buy the dates and the coconut sugar and all the other alternative ingredients, even if I did want to, which, as I said, I do not. I’m just a celiac with an egg allergy. Period. That’s all. Oh, and corn, and all things corn, except apparently corn starch, which seems to be okay. Hi Ellen, thanks for the note. I have added your request to our recipe request list! Yes, that should work! The two can typically be used interchangeably in quick breads and cookies and is a great gluten-free alternative to traditional flours. Great! Can’t wait to try them! I have a bag of almond flour waiting to be used! Delicious, easy and naturally sweetend. My kind of recipe! I added a pinch of salt and a tsp of vanilla. Yum! Hi! I am thinking that either the oven temperature is too low or they were taken out too soon. When baking always keep an eye on your cookies and take them out when they’re golden. Hope this helps! Since banana sizes vary so much, can I assume 1 banana equals ½ cup measure? (I took ½ cup). Yes, it should be ~1/2 cup! Thank you for the review, Margaret! We are glad that you enjoyed these! Can I omit or find alternative for banana?? Hi Dana, could I use tahini instead of nut butter? Yes I think that should work, though we haven’t tried it! Report back if you give it a try! I just made these cookies this afternoon and they turned out so yummy!!!! It was very hard to not eat them all in one sitting. Thank you, Dana! Just wondering if there is a substitute for oats? Hi! We haven’t tried a sub for oats, but perhaps another grain would work? Maybe quinoa flakes? 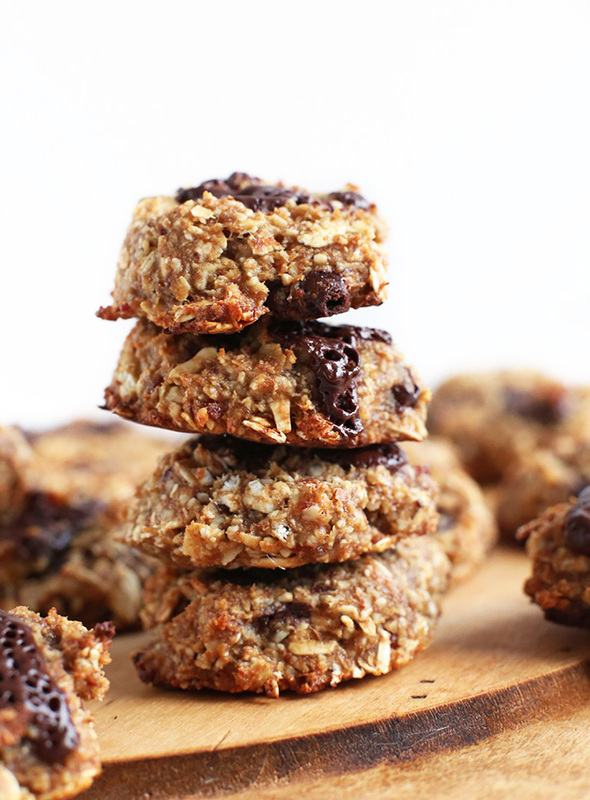 I love a good textured cookie and these offer just that! I opted for black mission figs because my grocery did not have dates or prunes. The cookies didn’t turn out so lovely like the picture so definitely stick to the recipe! But they were good once I added an extra helping of dark chocolate chip – yum! I loved these! I’ve already made them three times now…a favourite with my gluten free friends! And perfect for me as a vegan…and guilt free! What more could you ask for?? These are sooo good! I added 2 tablespoons of ground flax seeds but other than that stuck to the recipe and they turned out delish. Perfect amount of sweetness (love dates) but no stomach ache from processed sugar, butter and flour. Definite 5 star. Hi! You could try cashew meal instead of almonds or a sunflower meal? Let me know how it goes! I’ve made so many vegan & gluten free cookies but these are hands down my fav! Really hit the sugar-craving spot! Thank you Dana you legend!! thank you Dana for such an easy and DELICIOUS recipe. I made a batch of them and between my husband and I they only lasted two days. Definitely will remake and even give them out as gifts! Hi. Dana. Lovely site..lovely recipes. Just tried this one. Any substitute for bananas. We don’t like its taste. Secondly I was expecting a crunchy cookies, instead I got the soft cookies. What might have went wrong? Can I expect measurements in metric system? I have loved making so many of your delicious recipes! Do you know if it would be possible to swap the almond flour in this recipe for flax meal? Thanks so much! These are simple to make and delicious! Thank you!! i made a half batch of these the other night and promptly ate half of them straight out of the oven! so good! i liked them best warm from the oven so next time i will just bake a few at a time when the cookie craving hits so that i can enjoy fresh, warm (relatively healthy) cookies. thanks for a simple and delicious recipe! I made these, and the taste is pretty good- but they’re quite dry. I fixed that by serving them dipped them in a little unsweetened applesauce- perhaps I’ll try again next time with some extra banana. Good overall, though. I made these tonight as I had all the ingredients on hand. I mixed in some currants and they came out soooo yummy! My husband loved them, too! Will definitely be making these again! Thank you! I don’t know if anyone has mentioned it before, but they taste even better FROZEN! I guess the dates helps the cookies to stay soft. I add chocolate chips for crunchy texture. Thanks for sharing this! This is such a cool method of making cookies — very forgiving of substitutions. I think of it more as a method than a recipe because it seems like you can sub different nut or seed meal and dry ingredients pretty easily. I was out of almonds, but I had raw pumpkin seeds and walnuts, so I whizzed 3/4 c. of a mixture of them into a meal in the blender — the taste was great! I was out of rolled oats, so I whizzed some (dry) quick-cook steel cut in the blender to make a course flour–again, the results were good. I added about 1/4 c. of flax seeds to take up some of the moisture (I had to add about 1/4 c. of water to the soaked dates to get them to blend smoothly). They’re absolutely delicious with dark chocolate and dried cranberries!!! 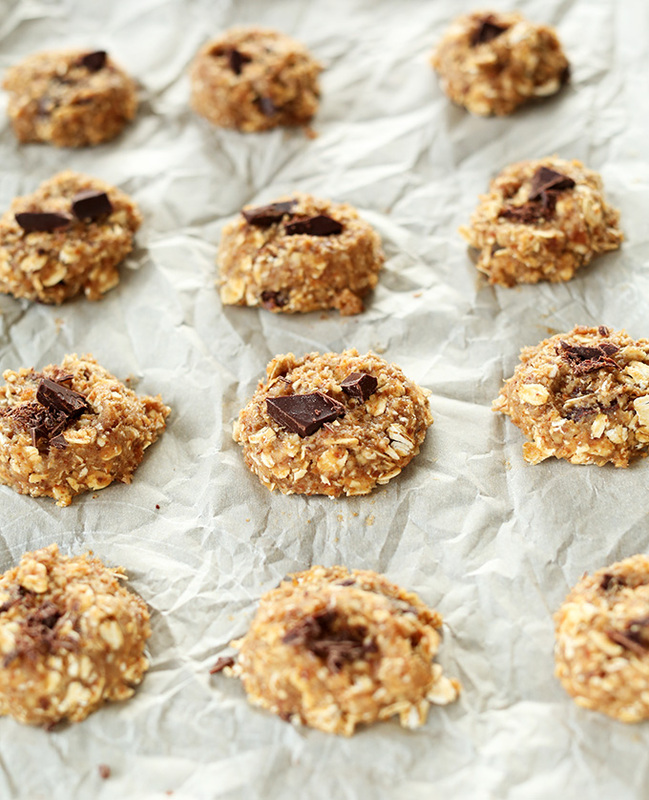 I made these with banana and I made a batch with 1/4 can pumpkin – both good. The pumpkin wasn’t as chewy and obviously didn’t have the banana flavor, more dense as well. I used Enjoy Life chocolate chips. I think they’d also be good with dried cranberry’s and orange zest. Hi! I’ve just put it into the oven and I’m super excited now. This will be my first cookie ever, but it already looked and tasted superb! ^^ Thanks for the recipe! I made these tonight. They are wonderful. No oil, no added sugar, GF, and delicious. Soaking the dates is a brilliant idea. I’ve written off some recipes in the past because using dates gave me too much grief. This will be a regular go to I’m sure of it. I tried making them and they are quite nice, not too sweet and they’re soft and slightly chewy. I used dark chocolate peanut butter instead of almond butter and cos the rolled oats I could find was too big a package I used oat bran instead. Made little thumb sized coins and they turned out fine, dusted with the leftover ground almond I had and look great. But banana smell slightly stronger than expected. Good if you’re finding a healthy cookie that is not only vegan friendly, but suitable for older generations too. I was finding a vegetarian cookie as I was making them for my classmates, cos some are vegetarian, bringing it tomorrow for them to try. Very nice. I added an extra banana as I had two turning. So added a handful more mixed oats and ground almonds. Also used a bar of dark chocolate. Really delicious! Sprinkled some sesame seeds on too before baking. I used used a roasted sweet potato in place of the banana, and a combination of ground walnuts, pumpkin seeds, and roasted flax seeds in place of the almond meal. I added some dried cherries and pumpkin spice. They’re perfect. Anything else which can b added instead of banana.. M vegan, diabetic so .. No bananas no sugar for me .. These are amazing!!! I have made numerous batches for my co-workers! Girl, You the bomb! I don’t think I have I’ve ever left a comment on this blog, but I will say that I’ve made so many recipes from this website, the recipes are more times than not really good, and I always come back! Making these cookies for the second time! I tried these cookies from a friend and decided to make my own since the ingredients are things I usually have in my kitchen. They were delicious the first time and even more so when I made them myself :). I just want to include a brief comment to the folks who are having a hard time with dates without a food processor. There is such thing as pureed dates, which you can certainly find at Middle Eastern stores. I used half a cup with the puree and the taste is good enough for me. Since pureed dates come packaged, you will have some left over for more cookies. Thanks for the recipe and I look forward o trying more from this blog. These are awesome! I used gluten free oat flour in place of the almond meal to keep the fat down (following 80/10/10 rule) and added a handful of raisins and a teaspoon of cinnamon. I love that they are sugar, salt, and baking soda free. Will be using this as my go to base recipe for cookies all the time! Hi, what can I substitute banana with ? You can try using applesauce, but I haven’t tried it that way and can’t guarantee the results. I ate all of them. Instantly. These are delicious! I might have used to many dates since I just eyed what 1 cup might look like :) but either way, absolutely delicious! My 4yr old says you are beautiful and that is why we should make your cookies. Good enough for me ? What can you use in place of almond meal? See our recipe FAQ here! hello! I just made these with sunflower seeds instead of almond flour mainly because the price of Almonds/almondflour is super expensive in Europe. I also added 3 tablespoons of Beef gelatine (because I am trying to add more of gelatine in my diet to help correct some digestion issues) THE Point being they turned out really really well and are very satisfying. I added a pumpkin spice mix so they have great flavour. Thanks again for this super flexible cookie! even better I threw them together before work no stress! I live in India and almond butter is next to impossible to source. Can I make it with almonds. If yes, how ? My daughter and I are allergic to peanut butter so we have to make it wit the almond butter only unless there is another alternate. Yes! Roast them for 10-15 minutes at 350 F (176 C), then grind in a food processor until smooth! These are so good!! I added shredded coconut and dried cranberries and it was delicious. Definitely making them again! I made these tonight and they were SOOOO good! Also very easy with only a handful of ingredients that I usually have in my kitchen anyways. Thank you for the recipe. I will definitely be making again. it sounds like the perfect recipe for my boyfriends parents. Since, that parcel has to go abroad I wanted to know how long they stay okay. How it can be gluten free when you put oats inside? Oats are inherently gluten free, but they are often processed in facilities that also process grains that do contain gluten. You can buy gluten free oats that meet cross-contamination standards. I found pre-chopped dates, dumped them in a large measuring cup with water, nuked it for a minute or two (water was already hot) and then added them. They had already been sitting in hot water for maybe 4 minutes but I was trying to expedite the soaking up of water. Worked. Then I used a cookie scoop (small size) for making little balls (made it much easier than forming with two spoons or hands) and pushed a few pieces of dark choc from trader joes into the top of the cookie to press it into a somewhat disk shape. Baked first ones for 15, turned out barely tan on edges but bottom perfectly tan, choc melted but didn’t run. The 2nd batch I’m trying 18 minutes. The last will correspond to the best of the two. I doubled the recipe, didn’t add more nuts or anything b/c it had so much almond in it already and banana and dates, etc etc. I did add a little cinnamon, maybe 1/2 tsp or less to give it a cinnamon edge and didn’t notice overpowering banana so maybe that’s the trick if ppl want to cut the banana taste. Can I substitute or leave out the oats for this recipe? I have everything else at hand! :) Thanks for continuing to make great food! I made these 1/2T size for bites with ghiradelli chocolate chips. They were simple to make and great tasting! Just what I was looking for, thank you. First comment here! (For the first try from the blog, youhou!). I just made a batch and they turned out delicious! Thanks a lot for the recipe. I don’t have a food processor so I used my hand blender, totally worked out. Also I choose peanut butter. I made a batch of these cookies yesterday and they’re delicious! Great recipe, thank you! I don’t have a food processor so the date chopping did take a while, but was completely worth it, and I used peanut butter in place of almond butter. these look yummy. Do you have an idea of how long they will keep? I would like to ship them as a gift. They should keep for 3-4 days. Loved them. My Family and I are on a 21 day Daniel fast and this helped so much with the cravings. Thanks for sharing. Am I missing it, or is there not an oven temperature in the recipe? I would love to try these but don’t want to guess about the temp. Thanks! I really want to try these cookies but I do not have a food processor. How would I go about this? They were extremely easy to make and soooooo delicious. Even the toughest critic (my Dad) fell head over heels in dessert love! Thanks!! I love how simple this recipe is but I don’t have a food processor. Would I be able to use a blender instead? Thank you so much! They turned out great! This is by far my favorite recipe. I can’t wait to get a food processor, It’ll make it so much easier. I was diagnosed (2nd time) with a nasty cancer in October. I went from junk food, wine, sugar, pop & fast food to a very strict vegan (& no oil or refined sugar) lifestyle. Hoping to beat this bugger! Anyway the holidays were bleak with no yummy cookies & pies. These cookies are fabulous! And OK for me to eat! I’m so excited. Thanks & I hope to find more delicious goodies on your site! Ah! Take heart. It sounds like you’re making some positive changes. Hope you enjoy these cookies! I loved these cookies! My boyfriend dubbed them “Granola Clusters” to appeal to our friends and family who are wary when given a “healthy” cookie. They were excellent! The first batch I used choc chips. The second and third time around I’m trying dried cranberries. Thank you for your recipes and commitment to your blog/work. I just purchased your “31 meals” cookbook and looking forward to trying the recipes for the new year. Can’t wait till your next book hits shelves in April! My family lovessss these cookies. I’m unable to eat because I just had jaw surgery and still healing. I experimented with making my own almond butter. I accidentally burnt the almonds in the oven so I started over using a smaller amount just in case. So I made my awesome almond butter and for anyone who doesn’t know (just toast the almonds to release the oils and throw them in the food processor until its a consistency u like. BAM!) So because I literally had a small amount of almond butter I played around with the amounts of ingredients I’ll use…to be honest I rarely measure I usually always eye ball. So my dough actually came out prefect. I divided it into threes. 1 for coconut flakes, 1 for chocolate chips, and 1 for walnuts. While it baked I melted some milk Chocolate. Drizzled well iced half of the cookies. So as my small tester these cookies were amazing. My household keeps thanking me so I had to come thank you. I will be recreating these for sure. I just made these as a Christmas treat for a choose vegan friend and her family. The batter is quite sticky- and the author notes this. I added almond meal, but discovered a good trick to mitigate stickiness! Get a separate bowl and dump a bit of almond meal in the bowl, dunk your hands in, and then grab the balls of dough before setting on the baking sheet and roll them in almond meal. Then form the little disks. I also out a square of dark chocolate in the center of each one and mixed unsweetened coconut flakes in- delicious!! Thanks for the recipe!! I’ve made these three times already. So good and guilt-free! Thank you! I tried this particular recipe without the bananas and with some ground ginger and the biscuits were delicious! I made these for the guys at the fire station today. I subbed out almond meal for some walnuts I ground into a meal and used peanut butter instead of almond butter. Also we did not have dates but we had raisins so I soaked a cup of raisins instead. They came out awesome. Thank you. These cookies look delicious! Unfortunately my husband is allergic to bananas. Do you think they would be ok without the bananas or do you recommend a substitution for the bananas? They’re so key to the recipe, I’m afraid not! I have tried the raw recipes from this blog and they turn out AMAZING even though I am newbie at dessert making! Trying the baking ones now but need assistance. Does anyone know how I should adjust the baking time if I am using a fan forced oven (temperature and time)? You can soak the dates in warm water to soften them. But it seems you do indeed still need a food processor. I left dates in warm water for 20 mins and still could not get them to the right consistency. They were still very hard. Really intolerant to almonds, and while switching from almond to rice milk has been easy, there are a lot of recipes that call for almond meal and almond flour – what are good substitutes for these? thanks!! You can usually try subbing oat flour or rolled oats! Not sure, but if you give it a try let me know! i felt the banana taste was a little overpowering. could i use grated zucchini? Try canned butternut squash, sweet potato or pumpkin. One of my go to’s now! I added chia seeds and raisins…sooo good! I’ve also added a chunk of organic dark chocolate on top of each cookie, yum. 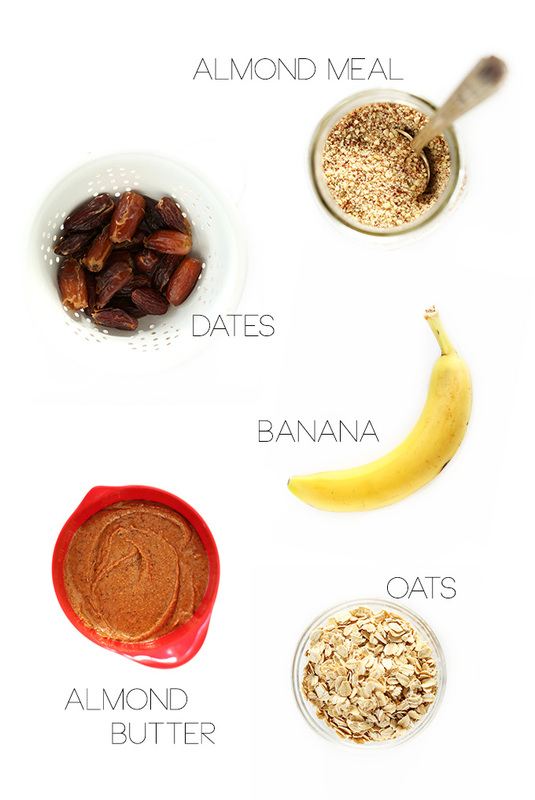 Love this easy recipe…perfect for after a work out or run. So wonderful! Glad you like these, Kylie! Made a DOUBLE batch of these yesterday. There are 2 of us in the house. The cookies are nearly gone today. Needless to say these are addictive and divine. Dana, you leave me breathless…. Hello! I sooo want to make these cookies they look so delicious. I cannot eat nuts though, is there something i could substitute the almond meal with? I was thinking substituting the almond butter with sunflower seed butter but I am not sure about the almond meal. Perhaps more oats? Or a seed, such as sunflower? Yum, these look amazing! I always have tons of almond okara from making almond milk… and so I was wondering if you thought this recipe would work with okara instead of regular dry almond meal? Hi! I’ve made this before (using a food processor) and it was soooo delicious! I’m making this again. Do you think this would work with a Vitamix? oh my god thank you!! these are SO good. even the batter is delicious! I’m keeping these ingredients on hand and this recipe memorized so I can make them whenever. perfection! Do you think if I substituted with peanut butter, the flavor would be overpowering? Could I use coconut butter? Thanks for posting this, I am really excited to try it! These look delicious, can’t wait to try! I have one question on the almond meal, do you buy that or make your own by blending up in a food processor or grinder? I will be spending a lot of time on your site…thank you! I grind my own! But I have used Trader Joe’s and Bob’s Red Mill as well. I just made these delicious cookies. I could not find dates at my local grocery store so I used pitted prunes instead. They are just amazing and taste sooooooo good. Thanks for this wonderful recipe. I am not a banana fan but understand the need in this recipe. However, can you taste the banana? You can, but it’s not super prominent. I had great success with your banana bread the other weekend, however these cookies came out terribly for me, such a shame as I was craving a sweet treat this evening! I’m not sure what happened, but i fear the coconut flour is to blame!… as I didn’t have almond meal so subbed for Coconut flour , but reduced the quantity to 1/2 a cup as I know how dry coconut flour can be. To make up for the coconut and its dryness i added some extra mashed banana. The mix seemed ok, though a little on the dry side, and it didn’t taste that sweet though.. I think if i do it again i’d add nut milk perhaps, and use almond meal and perhaps more nut butter! Not sure if you have any other suggestions ? Love your site though, and i’m sure i’ll have better luck another time! that’s what went wrong. Sorry! These cookies were amazing!!!!!! I have recently been diagnosed with interstitial cystitis which has made my diet very limited. But these cookies for my diet and taste amazing! Amazing recipe. My girl and I made and love them. Thanks. This is the third recipe of yours that I have tried. Today is my second time with these cookies. I love all of your recipes. I cannot wait to read the Detox Guide! So great! thanks for sharing Artus! I am from Singapore . I always wanted to bake cookies for my mum as she has some health issues and Dr advised her to avoid egg and many others. Her diet must include lots of grain. I saw ur website and I simply love it. Will try the above. btW the recipe stated tat I have to use some unsalted butter or peanut butter. May I know when do u need to add them in as I don see it in your procedure. Appreciate your advise. Once again, thank u for sharing your recipe. I love it!! what is the shelf life for these cookies? I’d say up to 3 days at room temp, 4 days in the fridge, and 3 weeks in the freezer! Hi Dana! What would you recommend to sub in for those of us coeliacs who can’t have oats? Thanks for your amazing site! That’s a tough one. More nuts? Thank you for such an easy recipe, my cookies are in the oven now and they already smell great! These look so yummy, and I can’t wait to try them. But, dates are really expensive where I live. I’m a university student on a tight budget, so I’m always looking to save. Is there something that I could easily replace them with? I found these cookies today and bought all the ingredients tonight. Making them as we speak. This is my first try at vegan cookies. Hopefulky I do them correctly. I made three batches. One I sent as a thank you, one I brought to class, and the other I baked for my family. I absolutely love them. They are so yummy especially just a few minutes after they’re out of the oven. Might be because I used an entire vegan chocolate bar in the recipe. SO much chocolate but no regrets. I got 50/50 review back on them. All the college kids I gave them to said they were good. My family and my boyfriend were less impressed. I give this recipe a big thumbs up though. It’s going in my cookbook. I love your website! In my family, there are 2 vegans, 1 vegetarian, and 3 meat eaters (one GF). Sometimes it is hard to make cookies like that. Being a vegan, not many recipes are compatible. So thanks! I made these today, and they turned out great! I’ve never done much baking, but this was easy. And rewarding. Thank you! Never used/ate dates so I was unsure about where to find them so I used raisins. Didn’t have almond meal so I used some raw almonds! These came out amazing!!!!!!!! Added some dairy free chocolate chunks! Thanks so much! I love this! My husband and I are researching healthy snacks to make for Christmas tomorrow. We’re going to enjoy a plant based Christmas and this recipe looks amazing….and your pictures are beautiful! Would you mind if I shared your blog on my own blog? I can share that address with you if you likel. Thanks again! Go ahead! Thanks Kellie. Merry Christmas! Great recipe, thankyou! I was just hoping someone could tell me how long these could keep for (approx)? I added 1/3 cup frozen pineapple and 1/2 cup brown sugar, 1 tablespoon tapioca starch, 1 tablespoon molasses, threw in 2 pods of cardamon & I whirled it up in my magic bullet smoothie maker w/ splashes of coconut creamer as needed to moisten…..(taking out the bits of well blended batter as I added ingredients). I folded in cranberries, dark chocolate pieces and pecans & this is some heavenly nonsense!!! thanks for the inspiration…. When there is a will there is a way!!! These cookies are awesome! I have been eating them spread with Almond Joy butter and they are simply delish! I finished the last of my batch this morning so will have to make some more. these are not gluten free because of the oats… It can be missleading to people with gluten related problems. The dates fused my blender! First and last time I’m blending dates together, but I persevered by hand instead making these cookies very expensive and a little less effortless, and they turned out pretty amazing. They were so cookie-like it was unreal and my gluten intolerant and vegan friends really enjoyed them too, thankyou! I used my blender too, and I had issues with the dates on my first batch. But with the second and third batches, I blended the banana and the dates together instead of dates first then banana. So much smoother. I just got done making these for the third time because everybody in my family loved them – vegans and non-vegans. These cookies are so easy to make and the taste and texture is absolutely divine! I don’t eat added sugar and these are perfect as a little sweet, healthy and satisfying treat without packing a ton of sugar and dairy. Thanks for this awesome recipe! What kind of food processor do you use? I’m looking to buy one and don’t know how to decide which one! Okay, I really want to make these, but I have a problem. I’m an omnivore, but many of my friends are vegan and I’m always on the lookout for new ways of making things that everyone can eat. So, great, banana instead of eggs for the binder. The problem is that I am highly allergic to bananas. Can you suggest a work-around for the banana in the recipe? If it’s not too much trouble, perhaps you could also suggest how much honey I could use to substitute for the dates? I love them, but sometimes I just want my oats and nuts without any fruit fancying up the joint. I simply ADORE your blog! Started following your IG account and started then visiting your blog. You are my inspiration and I always look forward to having a look at your new recipes and pics. All gorgeous. Thank you for sharing all of it with us. These sound delicious! Unfortunately, I’m allergic to bananas. Do you have any suggestions for a substitute/replacement? Made these tonight and they were so good! I added dried cranberries and choc chips. I also sprinkled a little salt on each one before I popped them in the oven. My husband and I were devouring them! Love to hear it! Glad you enjoyed them, Steph. have You Tried A Replacement For The Oats? Unfortunately We Can Not Eat Them. Even GF Oats. I haven’t! But perhaps another grain would work? Maybe quinoa flakes? Try coconut flour. I used it in the waffles from the Sift and Stir blog instead of oat flour, and they turned out fantastic! I love how easy this recipe is, I made them this morning with a couple adjustments and they were amazing! I replaced the almond butter for a tbls of coconut oil and a 1/2 tbl if chia seeds soaked in a tbl of water, also I added a bit of organic vanilla and some cinnamon :) thanks for sharing with us. Just made these with my boyfriend and they turned out great! Thank you! Great recipe! Update…made these again, they’re dangerous coming straight from the freezer! So delicious! Hi Dana, I cooked them until they were a little bit golden brown, so probably is the coconut oil as you said, Thanks! I will try again! Hi guys, I love all your recipes! I just tried this one and I replaced some of the ingredients for things that I already have here, the almond butter for coconut oil, and the datils for dried prums, it was good! but not crunchy… I was wondering if I had followed your recipe the cookies could had been more crunchy? Cook them a little longer? Also, the coconut oil may have made them a little tender. Thanks for reading from Brazil! We hear it’s a beautiful country! 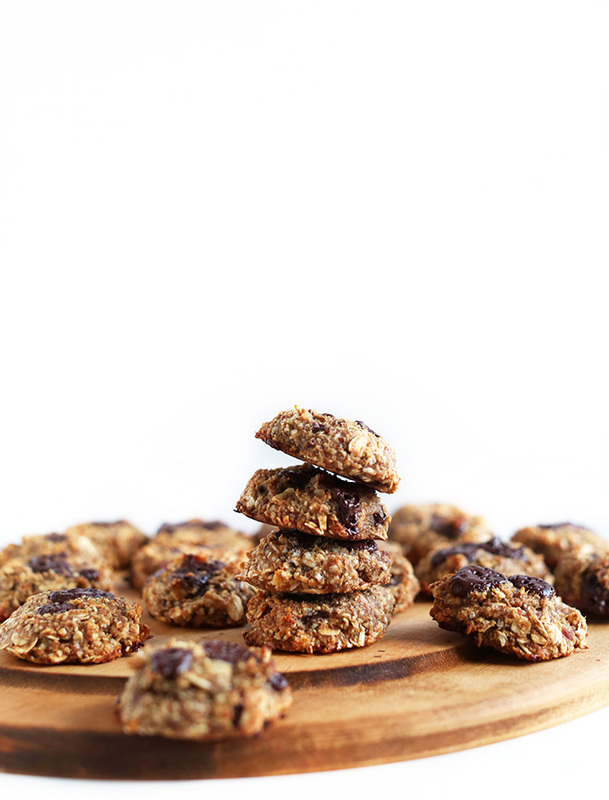 I goggled “vegan oatmeal cookies” this morning since I wanted to make some for my boys and your recipe popped up. I love your blog and have now signed up :-) These cookies are SO GOOD!! And my non-vegan boys loved them too!! I absolutely adore these cookies! I have made them myself, with a few minor additions. I basically searched the web this evening for an hour trying to find your recipe. I made them about three months ago for the first time, and although I thought I had bookmarked your site, I could not find it! wow this looks like such a great recipe! I’ve given up sugar for lent and i’ve been craving biscuits and cookies so much but I think I can allow myself to have these as the sugar is from the fruit which I’m having:) can’t wait to make these!!! Is there a good alternative to almond meal, for those of us allergic to almonds? I’m thinking sun butter instead of almond butter…. Totally! And how about cashew meal instead of almonds? Let me know how it goes! So I tried sun butter and flax meal for a nut free alternative and they were delicious! Thanks for coming up with such great recipes! Thanks for the alternative suggestion!! Upon finding your website I immediately ran into my kitchen to promptly bake these cookies. Oh my they are DELICIOUS, I’ve already inhaled two! So happy I found you guys and that you have gluten-free options. THANK YOU you’ve made my life a whole lot sweeter without me having to break out of my healthier baking/cooking habits. These were dee-lish! To me, they are crying out for a bit of shredded coconut, so next time I’m adding that in and my guess is that will take them to healthy cookie nirvana. Just wanted to let you know about a little typo here: “Let it our girl, I feel your pain…” I believe it should be out. Keep up the good work! Love your blog. Made these today and they were beautiful. Didn’t look as pretty as yours lol and I couldn’t finally Almond butter so left that out. Also made them by hand as I don’t own a processer of any kind. They are now all gone as everyone loved them. I used chopped Mast Brothers Chocolate and a dash of cinnamon! These are now a regular part of my life! Eating as clean as possible, and….I LOVE YOUR BLOG! I’m just in love with these cookies and your site! Thank you so much! The cookies look fab but I was wondering is there anything else that you can put instead of the bananas? just made these..so easy and the whole family loved them! thank you! I gave these a try at the weekend. Such an easy recipe. But I’m a rubbish baker and didn’t know what heat to bake them at so ended up burning them. Didn’t stop me eating them and just means I need to bake another batch! What temp should I try? Also what size roughly do you make them at. I only got 12 from the mix and they were 3_4 bite cookies…? Thanks. So since I’m french, (unfortunately we don’t use cups here :/) could you tell me how many grams does 1 cup of dates equals to ? Celine! Hello. Based on my research, I estimate that 1 cup of dates = about 8 ounces or 225 grams. Hope that helps! These cookies were spectacular. Just what we need for our exercise routines. Easy to make and with healthy, whole ingredients! Yay! Glad you enjoyed them. Cheers! Hello! I’m Brazilian and I don’t know how to speak English yet, rsss, but I’ll try (if I make any mistake, please, correct me). I like a lot of your recipes, especially the cookies! I just made these with peanut butter and I added in some chocolate chips and dried cherries. They’re like a PB and J dreamboat cookie (official title). All aboard! OH MY WORD. Yes. I’m trying this variation next! So smart, Shannon! Ah, smart idea! I don’t use protein powder much anymore but it would make a nice addition to these. Yummy these look amazing, and so so simple. I’m really learning how versatile bananas can be in baking, so thanks for showing me yet another way to use ’em! Looks yummy!How about their shelf life? Can I freeze them? Yes! I would actually recommend freezing them past 2-3 days just to keep them fresh. They’d be delightful frozen, I think. Otherwise, just let them set out for 10-15 minutes and they’ll be good to go. You can freeze them after baking, I’d say. Then just let them set out for 5-10 minutes before eating (although they’d essentially be like a frozen cookie straight out of the cookie, which I kind of love). Hope that helps! I wanna kiss you for coming up with this recipe. After having a baby I have been craving tons of sweets and this will satiate my cravings and not make me feel like I am going to gain a bajillion lbs! They look absolutely amazing, I’ll need to try these!!! Looks absolutely delicious! Thank you for sharing the recipe!!! Would be extra yummy with some dark chocolate as well! I love cookies that come together in a food processor. So much easier, and I love all the healthy ingredients in these! Sometimes you just need a break from super sweet buttery cookies. Sometimes. ;) Pinned. Dates are kind of the glue that holds it all together. I wouldn’t recommend subbing 100% maple syrup. I would recommend using another dried fruit, such as raisins or prunes if you have them. I kind of love cookies like these. They are the best of both worlds! 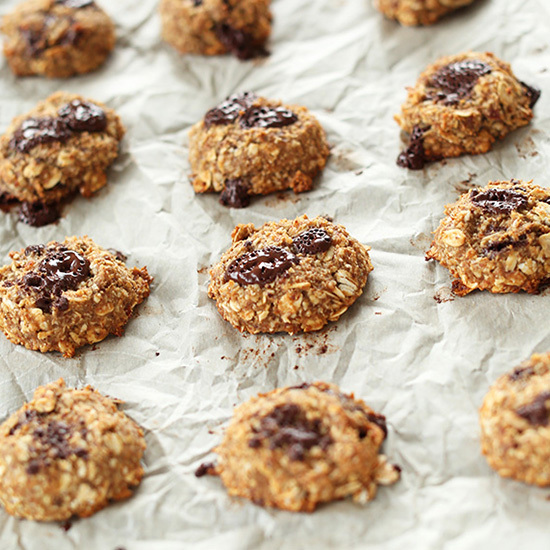 You can’t go wrong with an easy + healthy cookie recipe! I am so tickled by these cookies! Can’t wait to make them. Question- what’s the difference between meal and flour? I made cashew milk and dried the meal in the oven. Can this be used in baking as cashew meal? Thanks! Almond flour is made from almonds that have been blanched. Almond meal is simply raw almonds ground. Hope that helps! For this recipe, I would say your cashew meal would probably work! Hope that helps, Joanie! All my fave ingredients; thanks for sharing! I got a quick question, If I used ground oats instead of ground almond meal would that work as well? Benji, it would affect the flavor and make them taste a bit more bland because they have a distinct taste that will come through in the final product. Therefore, I would still recommend using almond meal (which I just grind from raw almonds). I hope you do, Candace! Let me know how they turn out! I just wanted to say that I absolutely love reading your blog. Recipes are always delicious and do-able, your sense of humor is wonderfully entertaining and you make eating healthy enjoyable. Thank you for taking your time to share your wonderful talents! Oh, this made my day! Thanks for saying hello, Tricia! Be sure to let us know of any recipe suggestions or requests. We’re here to please!! Holy! How freaking easy and delicious! I need these in my life stat! You are my hero. I’m on day 4 of a 28-day challenge that doesn’t allow for sugar or oil. These cookies might help me make it to the end (and beyond!). THANK YOU. Whoop! So glad these fit on your cleanse challenge! Enjoy, Beth! OMG, yes! These look incredible! I have some medjool dates, so I’m assuming I wouldn’t have to soak them because they’re so dang plump and juicy already? Totally! If they’re moist and sticky, no need to soak! Ooh, I have all of these things! Cookie time. A quick, healthy cookie. Sign me up girlll. Yum! I’m always on the look-out for healthier cookies because, um, I might eat cookies too often. Is that even possible?? Good question. Answer: NO. Especially if there’s no butter, sugar or flour! These cookies look crazy-good!! I love the look of this recipe! I’ve just found this site via another blogger – and I’m drooling! One question, how do I convert things like cups of dates to grams? Yay! So glad you found me, Amy. Thanksfully, you can usually google those types of conversion questions for a quick and pretty accurate answer. At a quick glance, I estimate that 1 cup of dates = ~ 8 ounces or 225 grams. Hope that helps! What?! Amazing and yummmmmmy!! Could I sub apple sauce for the banana? Carole, I’m not sure. I think so but if you try it, please let me know! It would be hugely helpful to other readers. The one concern would be that it wouldn’t add any additional sweetness. So taste your batter and it it needs a boost add a sweetener of choice (maple syrup, agave, honey if not vegan, brown sugar, etc.). the great thing about applesauce is it is locally available in the north. Bananas are tropical. 3 of us have tried to raise them in our homes (maryland and minnesota) with no success. I know this is an old post, but I just made this for the first time, and I subbed 1/4 cup of sugar free applesauce for the banana. I did add a splash of maple syrup, but I don’t think it was necessary. I’m sure it tastes a little different than the original recipe, but they worked great! We’re glad you enjoyed it, Mychal! Yum! These are definitely next on my list! Honestly, I think most of the batter would be eaten with a spoon before it even made it to the oven. I love cookies that cross over to the healthy land. Yum yum! Dates and almonds can be whirled into about anything: crust, cookies, pies, nut butters. It’s amazing! Hope you enjoy these, Maryea (beautiful name by the way). These look great! Can’t wait to try them. Thank you!